Dial 307-200-0040 then hit the number below, followed by the pound sign (#) to hear the artists talk about their work. A self guided brochure has been made available by the Albany County Tourism Board. You can pick up hard copies at the Laramie Chamber Business Alliance, University of Wyoming Art Museum, Laramie Main Street Alliance or Albany County Tourism Board. To download a pdf the brochure, click here. 3# Tierra y Libertad (Land and Liberty) at 119 S. First Street by Talal Cockar. 2011. 4# Grainery Grove by Meghan Meier at 111 E. Ivinson Ave. 2011 - 2013. 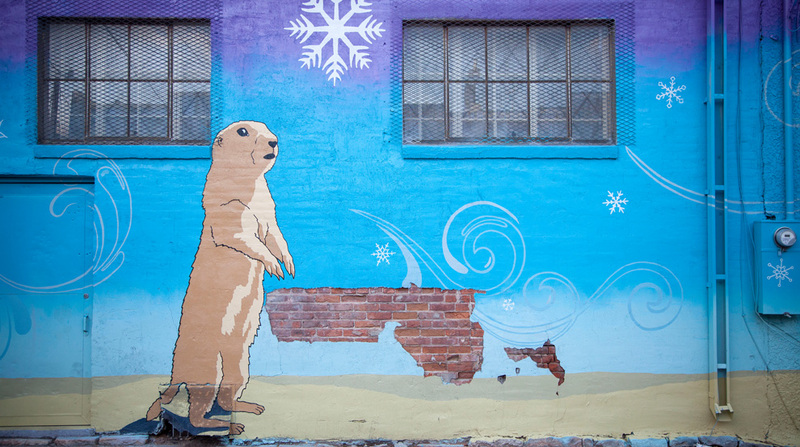 5# Prairie Dog Town by Jeff Hubbell and Lindsay Olson behind the Curiosity Shoppe, the Herb House and Atmosphere Mountain Works in the alley between First and Second streets. 2013. 6# Escape by Meghan Meier at Undercover Beds & Spas, Second and Garfield. 2012. 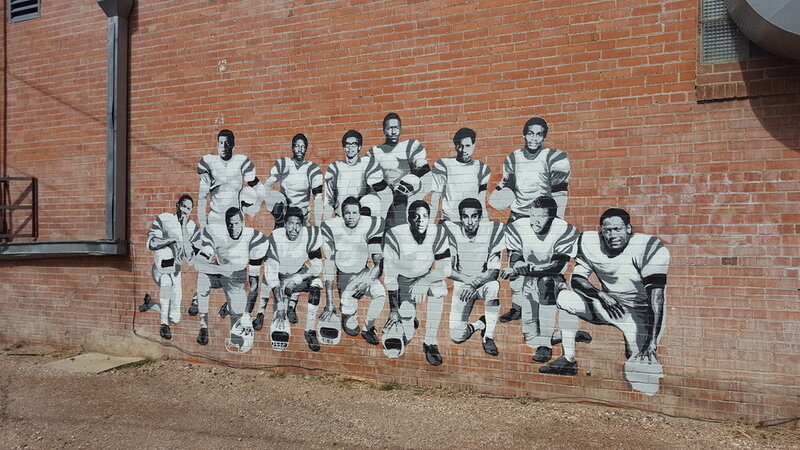 7# Hollyhock Haven by Travis Ivey at the City of Laramie parking lot at Second and Custer. 2011. 8# Book Shelf by Dan Toro behind the Laramie Vision Clinic at 408 S. Second Street. 2013. - Note: this mural was destroyed in a fire, May 2014. 9# Growth by Dan Toro at Source Gas, 416 S. Third Street. 2012. 10# Crossing Sherman Hill by Travis Ivey at Modern Printing on Kearney between Third and Second. 2013. 11# We Built the Dream by Talal Cockar is at 606 S. 2nd Street (south side of NAPA Auto Parts). Completed in May 2014. 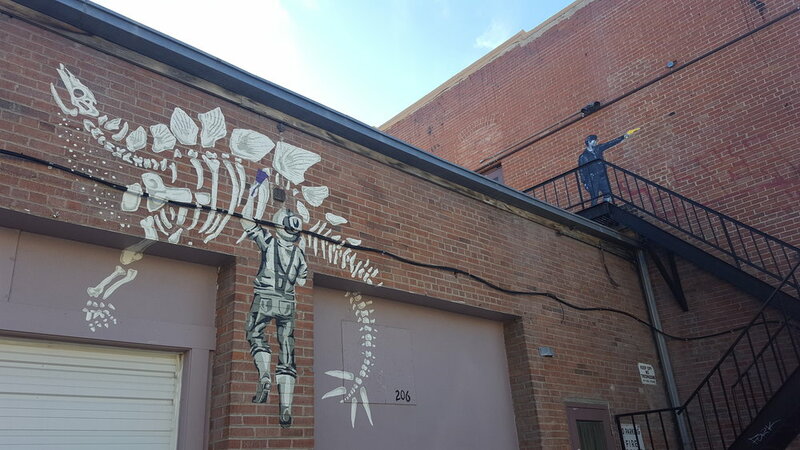 12#-20# Gill Street, the collaborative fish mural can be seen from the parking lot behind Coal Creek Coffee and Alititude's Chophouse at First and Grand and First and Garfield, or from the historic Garfield Street Footbridge. It was dedicated on June 13, 2014. An extension to Gill Street was completed in July 2018 by the following artists: John Deines, Billy Harris, Adam Herrera, Peter Laegried, Seth Leininger, Nichole Lumadue, Brook Mann, Bethann Merkle, Kara Siler, Adam Skadsen, Lindsay Stoffers, Meg Thompson, Lauren Whitby and Nancy Marlatt. A dedication, signage and audio is in the works. 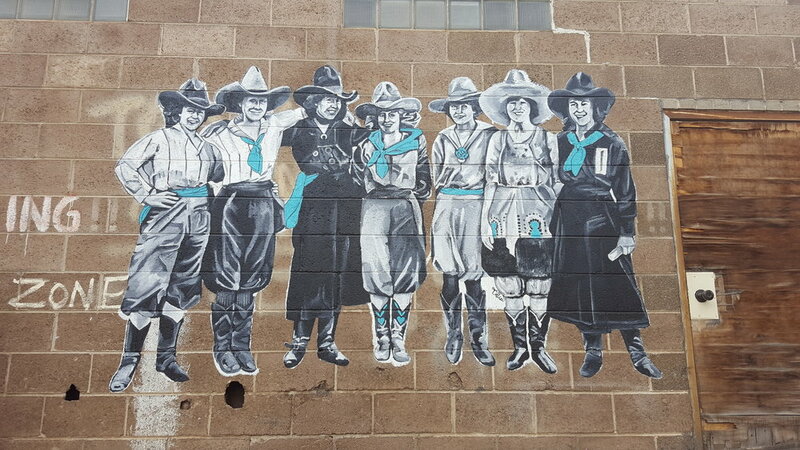 29# Laramie by June Glasson is at 3rd and Clark, wrapping around Hot Power Yoga at 352 N. Third Street. This piece was painted throughout the summer of 2017. 55# Many Hands by Meghan Meier is at 108 Grand Avenue, and was completed in 2015. Coming soon … audio recordings for the Historic Figural Alley. #30 Overview of the Historic Figure Alley project, started in 2015 in the alley between 211 Grand Avenue and 218 Ivinson Avenue. #31 Chelsea Lowry's "The Originals", 2016 on the east facing wall at 211 Grand Ave.
#35 Colleen Friday and Adrienne Vetter's Sherman Sage, 2015 in the alley behind 217 Grand Ave.